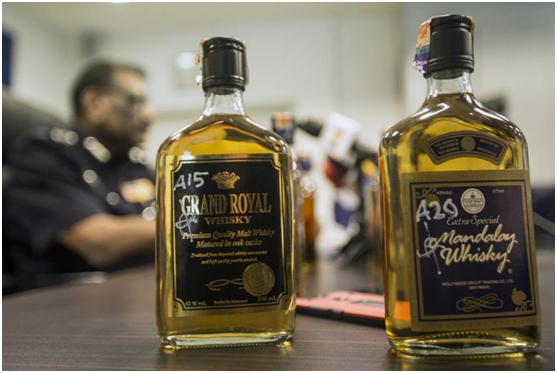 September 18, 2018 – Sungai Buloh, Malaysia and reported Taiwan media said, Malaysia is currently experiencing the biggest scale of “counterfeit alcohol killing” in recent years. Malaysian police said that since the evening of September 17, Kuala Lumpur and Selangor region, a large number of cases of methanol poisoning were reported, until the early morning of September 19, the Malaysian Ministry of Health has confirmed 51 cases, in meantime 19 of them died and 14 people being hospitalized with life-threatening. Malaysian police said that most of the poisoned patients were foreigners from Nepal and South Asia. They also drank a variety of foreign brands of beer and whiskey before the symptoms broke out, so the case is also on the “private brewing of counterfeit wine” direction with investigation and seizing. 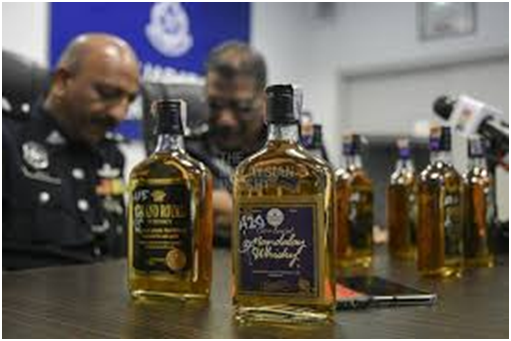 According to Taiwan’s Joint News Net on September 19, Malaysian police said 51 cases of alcohol poisoning had been reported within 48 hours since September 17, including 6 cases in Kuala Lumpur and 45 cases in Selangor State. As for the death status of 19 persons, there are 2 Malaysia citizens, 2 Bangladeshi and 15 Nepalese. Reported that methanol poisoning is a common symptom of alcohol abuse incidents. Although methanol can be converted into highly toxic formaldehyde in the human body, many undesirable liquor traders and profiteers mix methanol into alcoholic drinks to make a huge profit because of its low production cost and similar odour to ethanol. The report also said that before the 51 cases of poisoning were reported, they all drunk or purchased of three brands of drinks including the Myanmar brand “Mandalay Whisky”, “Grand Royal Whisky” and the Indian brand “Kingfisher Beer”. Noor Hisham Abdullah, Director General of Health, Ministry of Health, Malaysia, said that, in general, after drinking fake alcohol drinks containing methanol within 12 to 48 hours, appear the early symptoms as dizziness, vomiting and diarrhea, nausea, drowsiness, shortness of breath and rapid heartbeat and so on. Because these discomforts are similar to alcohol-induced “drunkenness”, the patients are often delayed to see a doctor, resulting in visual nerve damage, permanent blindness and even death. Although Malaysia has one of the smallest drinkers in Asia, the tax on alcohol has risen further since September when sales and service taxes were changed, polices in Malaysia now suspect of the counterfeit liquor storm relevance with the massive expansion of underground counterfeit wineries, the report said. Please read more about Global News.